There is something deeply satisfying and humbling about tucking into the New York-style pies at Pizza Iconic. It seems so simple ― hand-tossed dough, tomato sauce, mozzarella cheese ― but when done the way it is done at this new pizzeria, it is good in a subtle, unassuming way that kind of creeps up, compelling one to go back for more whenever one gets an itch for gooey cheese, crisp crust and salty pepperoni. 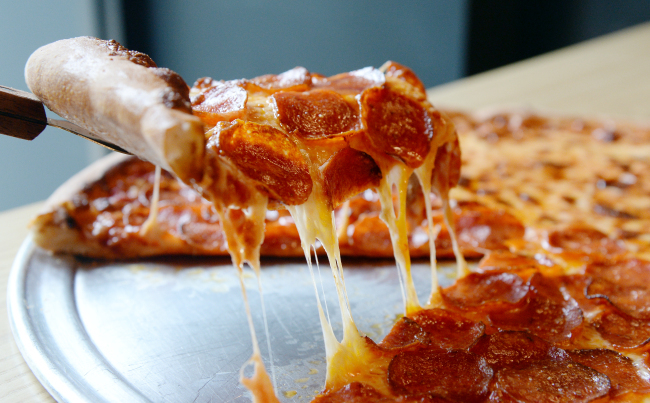 Perhaps it is those crisp, slightly greasy, small rounds of pepperoni laid on so thick that one can barely see the layer of bubbling cheese underneath. Or perhaps it is the cheese itself, chewy and molten hot, or the crust, in its not-too-thin, not-too-thick crispness, the perfect foundation for the punchy tomato sauce layered right over it. Then, of course, there is the sheer size of the pies, which clock in at the traditional New York-style 18 inches (45 centimeters), making for slices so large that one needs to fold them in half to get a bite. That, too, is a major boon, because a folded slice yields double the amount of crisp, thin crust and uber-crisp, small rounds of pepperoni per mouthful. Either way, when all is said and done, there is one very simple conclusion to make about this latest addition to Seoul’s growing pizza fold: The pizza at Pizza Iconic is good, filling and well worth the visit. While one can get these pies to-go, it is wise to grab one of the few seats in the house and then dig into the massive, bubbling pies straight out of the oven ― even if that is not exactly what owner Kim Yun-hyeon had in mind when he first opened his small shop late last year. “I originally made this a place where people going to watch baseball at Jamsil Stadium could get pizza to go, but people were coming in looking to sit down and eat,” Kim, 37, explained, gesturing to the handful of tables he ended up setting up inside the eatery. After learning how to make New York-style, Neopolitan and other styles of pizza in the U.S., Kim found a small stretch of turf located two bus stops away from Jamsil Baseball Stadium in Samseong-dong and opened Pizza Iconic in December. From this little shop, a good five-minute walk from Samseong Station, he spins out his pies, starting with his handmade dough, which he considers the anchor to his pizza. Listening to Kim slice his bubbling pies with his pizza wheel and hearing that nice crunchy whoosh, one can tell what he means. That sound serves as an auditory sign that one will not be served soggy slices of mediocre pie, that each massive slice will be crisp from crust to pointed edge. Kim keeps his menu simple and likes to recommend newcomers to start off with his no-topping cheese pie before moving on to his one-topping pepperoni. Why? Kim believes that a pizzeria’s identity shines through when the pie has no toppings. “If you have a lot of toppings, you cannot tell,” he explained. Then there are his more complex variations, like his three-cheese Cheese Lover pie, his mushroom-onion-mortadella-pepperoni festooned Stromboli and his Meat Lover pie. Kim revealed plans to add Detroit-style pizza to the menu in the near future. “Originally, I wanted to do a by-the-slice house,” Kim said, divulging his initial desire to showcase a diverse array of pizza styles. For the moment, Kim is sticking to his New York-style pies, dishing out hot, bubbling pizzas from his small perch in Seoul.